Rollways Campground was built in 1909 and was one of the first campgrounds established on the Huron. The pull-through campsites accommodate large motor homes and trailers. The day use area is adjacent to the Rollways Campground. A short, .5 hour walk between the day use site and Westgate Scenic Overlook provides visitors with access to the campground. The brochure is set to print on 11 x 17 paper, landscape (wide) orientation. To print on 8 1/2 x 11 paper set the print area to "shrink to printable area", this will make the text on the page smaller. The trail maps are set to printon 8.5x11 paper. Open 24 hours a day, 7 days a week unless otherwise posted. Forest quiet hours apply. Highlights - Camping is prohibited, except at designated campgrounds or campsites. Travel west on M-55 for 14.7 miles. Turn right and travel north on M-65 for 14 miles. Turn left and travel north on Rollways Rd. for 500 ft.
Travel west on River Rd. for 19 miles. Turn left and travel south on M-65 for 4.5 miles. Turn right and travel west on Rollways Rd. for 500 ft. The site is on the right. A short trail connects the campground to the day use area and Westgate Scenic Overlook. Several campsites have views of the river. 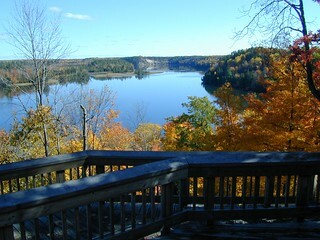 Visitors who walk on the trail between the campground and Westgate Overlook will have several opportunities to view the Au Sable River. The day use area has several picnic tables and a coverd pavilion with two fireplaces.